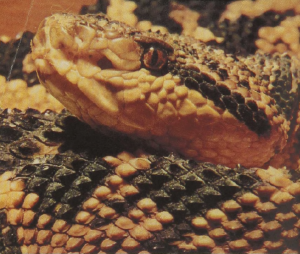 The Bushmaster is the largest and certainly among the most deadly of South American snakes. Contrary to earlier accounts, it appears to be a rather inoffensive animal: there are now many accounts of people having passed well within the snake’s striking distance without eliciting a visible response. The Bushmaster grows to be 1 2 feet long and differs from all other American pit vipers in that it lays eggs. Its very beautiful skin is pale brown, often with a pinkish tone on which a series of large, dark-brown, geometrically spaced blotches march down the back. The scales of the Bushmaster differ from those of most other snakes: instead of being variously flattened or keeled plates, each is rounded into a knob-like structure that gives the snake’s body a pebbled appearance. Bushmasters are rather shy and do not survive well in captivity, possibly because they are adapted to the relatively cool temperatures of the heavily forested areas which never reach the high temperature levels of open tropical savannas. The specific name muta refers to the lack of a rattle.